Feel the love! I have always been pretty ambivalent about Valentine’s Day, but in my increasing years I am relieved to say that it is just another day to show, and get, some love. Remember during the dating years, the extreme pressure to perform well on the Valentine-o-meter? My expectations were always ridiculously unachievable for all but the perfect, Cary Grant-esque, only-in-the-movies man. Of course those expectations were rarely if ever met. Due to a very unfortunate connection, I came to despise roses, so heaven help the man who ever bought me those. Chocolates were good, dinners out with wine were crucial, but part of me actually bought into the jewellery stores’ mega-advertising blitz that indicated without doubt that diamonds, or at least semi-precious stones and some gold, were the only TRUE way to show love. Oh, how little I knew. 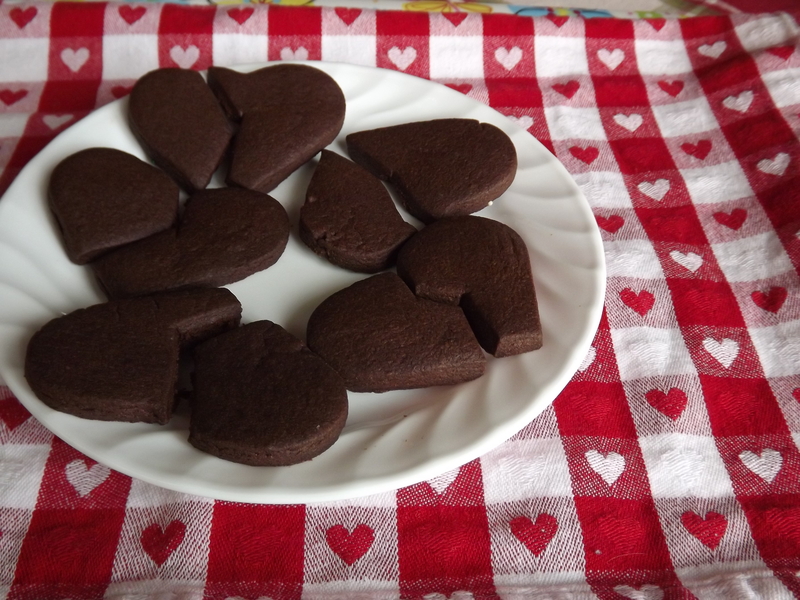 Today I sneak out to buy a few little treats for my loved ones, I bake a bunch of heart-shaped treats and I hunker down with my girls to make home-made Valentines for all. 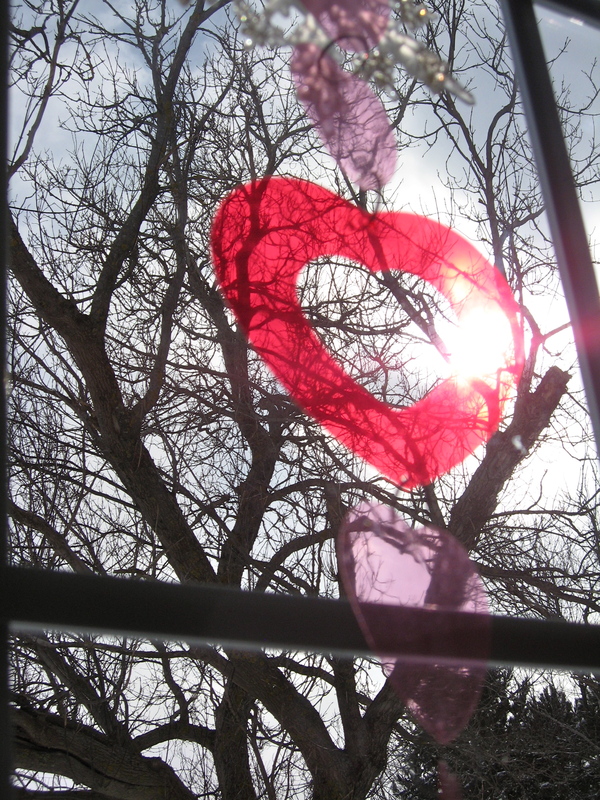 It is an excuse to hang hearts everywhere, a blitz of colour in the greyish days of February. Now I know how a gentleman truly shows love. Sure, he remembers to hand over a homemade Valentine’s card, and maybe a nice hot cup of tea in bed early in the morning. But there are other things. He might always come to the rescue to squash an earwig every single time he is needed. He gets up every single time in the middle of the night to get the baby up and changed, and then brings her over for mama to feed. He uncomplainingly endures the vagaries of household hormonal upheaval with a grim sense that the tides WILL shift again and cheeriness will return. He embraces the girly world he lives in (even the cats are female) with gusto, while also making sure the little girls love gender-neutral stuff like Lego and geocaching. He scrapes the windshield on a freezing-cold winter day, so that when I go out, I just hop in and head to work. Wow, how lucky am I? 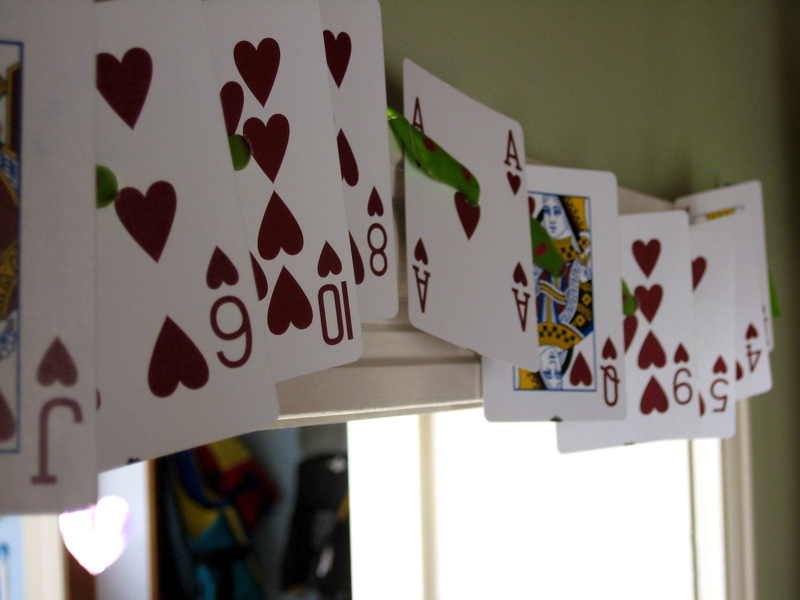 By the way, the garland is a fun and simple idea I got from Pinterest…just poke holes in the heart suit of playing cards and string them on a ribbon. Voilà…Valentine’s garland, free. The sun is up, kind of. The sky is blue, and everyone else has just left for the day. 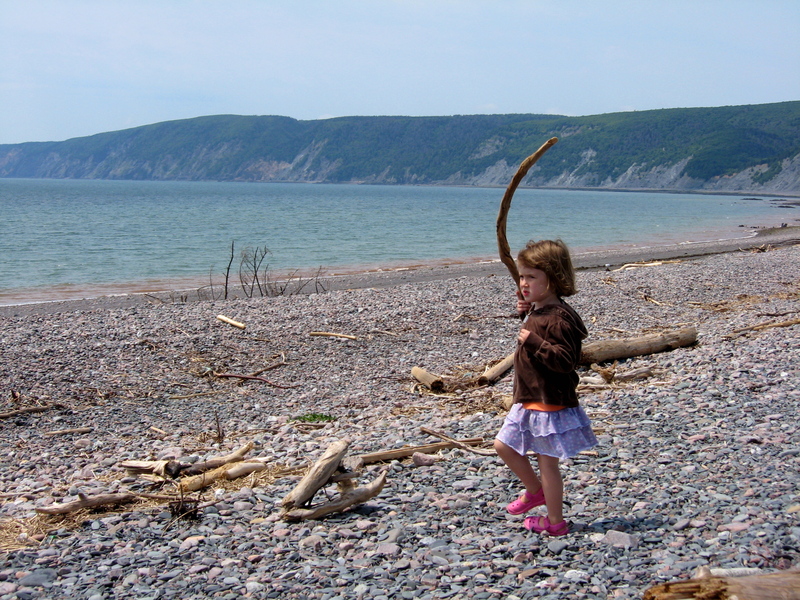 Earlier this morning I was thinking about summertime, places we will go and campfires we will have, swimming in the ocean and camping under the stars. Always at this time of year I pine for the warmth of the sun and seeing green things growing in the garden. As I get caught up in this fair-weather reverie, I catch myself and take a deep, conscious breath. I hear the girls’ voices, chattering in their bedroom about what fancy clothes they might put on this morning. I hear a bird outside singing “cheeseburger, cheeseburger.” I think it is a chickadee, and for some reason I always think it sounds like they are calling for a burger. I have had a good breakfast, and I am thinking of making some coffee. And it strikes me that for all my work on being mindful, I have still not gotten out of the habit of daydreaming about the time other than THIS time. It is something we all do, of course, but sometimes it keeps me from enjoying the time I am actually in, with all this daydreaming and reminiscing. So, what is good about this particular time? Beautiful light outside, and the days are already getting longer. Right now the sun is lighting the underside of the clouds so that it is silver-glowing. 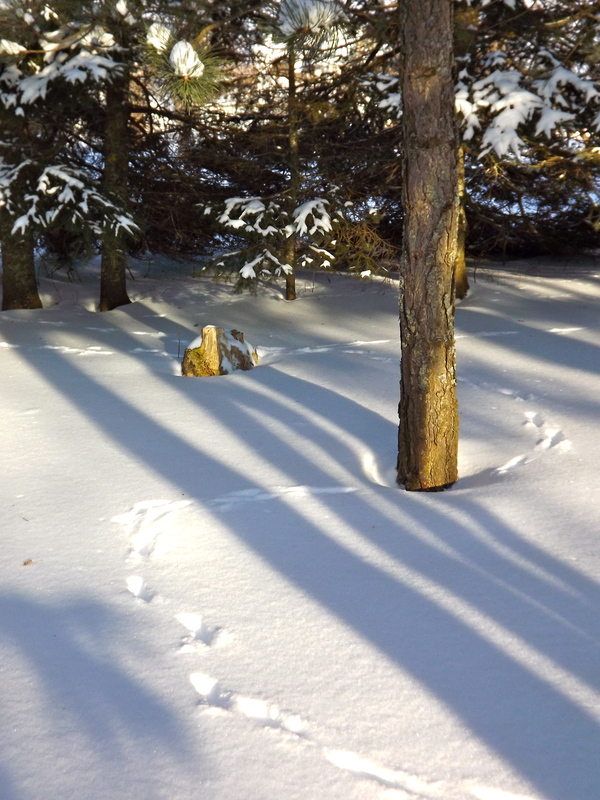 On the more practical side, it has been an easy winter so far, both on snowfall and on the heating bill, especially compared to last year’s mega-winter. My family is healthy, and happy. We all have a healthy lunch packed. I got a $179 LL Bean trench coat at Frenchy’s yesterday for only $5. 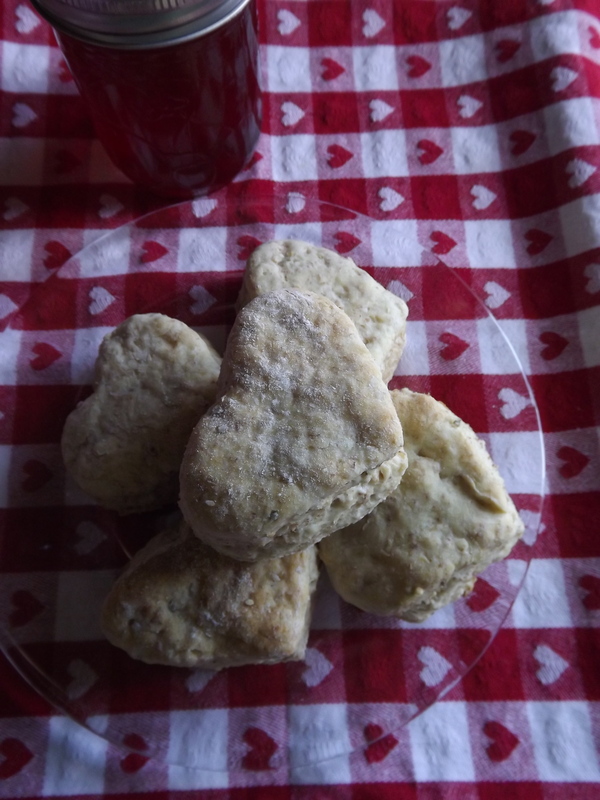 Ava and I made a beautiful batch of heart-shaped biscuits which taste absolutely heavenly with quince jelly. At this moment, the sun is beaming in the big window onto me and my desk, and if I turn my face towards it and close my eyes, I feel its warmth. The cat is purring blissfully and settling in for a sunshine-spot nap. Is all this stuff just “stuff?” Or is this what life is all about? Not quite sure, but I know writing it down makes it all seem like it is truly a beautiful day. Lazy days of staying in our pajamas half the day and just playing. The snow that arrived Christmas Eve, just in time for snowmen-building. Discovering different holiday books to read, like Jan Brett’s classics The Wild Christmas Reindeer and The Christmas Trolls. Weird and wonderful. The tree I made out of old books in the library. Impromptu dance recitals in the living room, with ballet as well as Egyptian, Chinese, Irish and Scottish numbers complete with costume changes. Our four-year-old and six-year-old did this, not us. Although Dan did do one lovely pirouette. The 20 lb local turkey whose delicious leftovers will now fill our freezer with convenient pot pies because we are all turkeyed out. 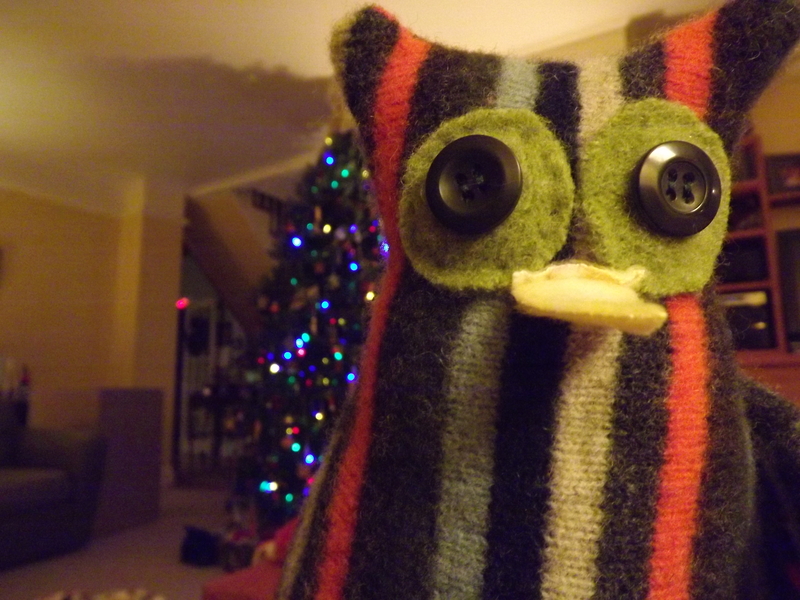 The upcycled wool owls that I made for our girls. Discovering that we all love air hockey. Who knew? All the gifts made by our own hands, small ones and big ones. Digging out all the board games and puzzles and spending time unplugged from screen time of any kind. 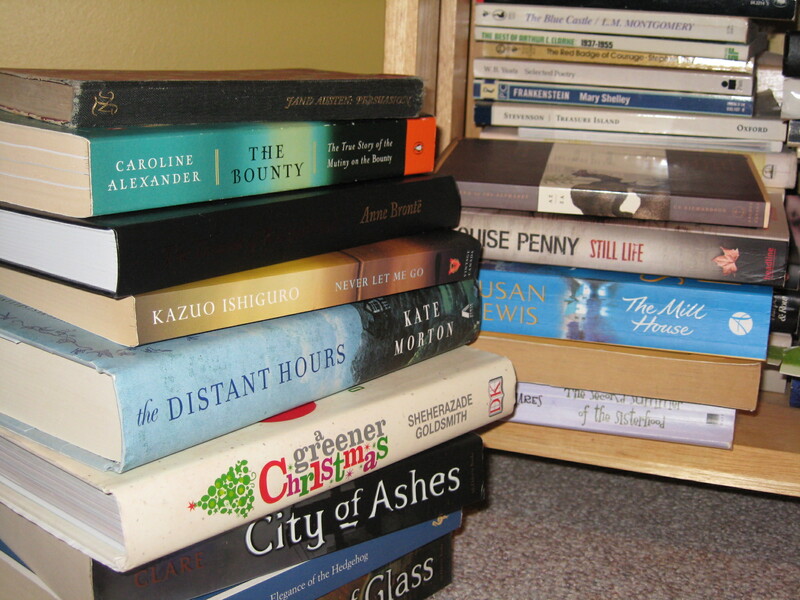 Good reads: right now I am deep into Kazuo Ishiguro’s haunting Never let me go, as well as Patrick Taylor’s An Irish country Christmas (for holiday levity), with a little of Suzanne Desrochers’ Bride of New France thrown in for Canadian content and fascinating history. 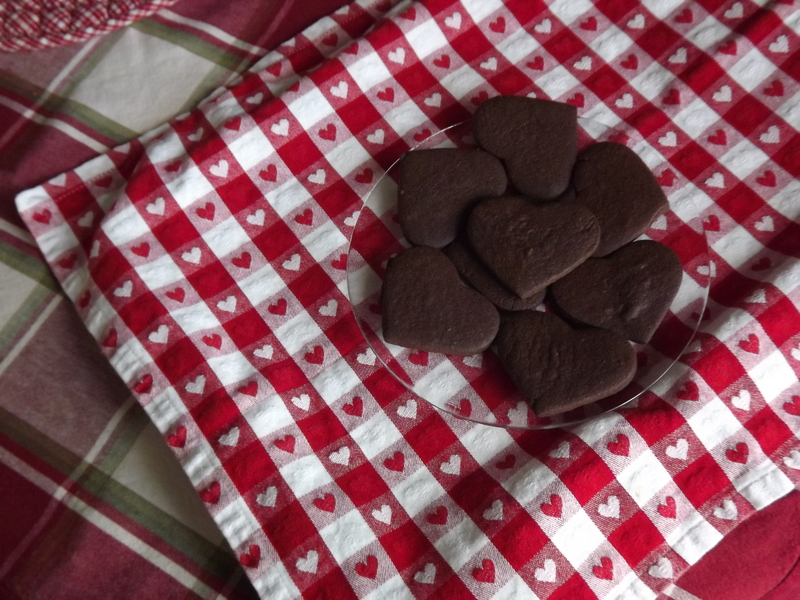 Fabulous new treat, cocoa shortbread cookies from the Saltscapes Traditional Holiday Fare cookbook. So easy, so sinful. Sift flour, cocoa, and salt. In a large bowl cream butter until light and fluffy. Gradually add icing sugar, beating until smooth. Add vanilla. Gradually add flour mixture, stirring well. Chill for at least one hour. But not any longer or else it turns rock hard as it did for me. Divide dough and roll out, cut into shapes with cookie cutters, OR just form into a log and slice like icebox cookies, much easier. Bake at 350 Celsius for 10-12 minutes. Makes about 3 dozen which should last about a DAY. There is a cookie that is truly legendary in our family, and that is my great-grandmother’s giant molasses cookies. They were huge, they were perfectly round, they smelled so delicious that my mouth is actually watering just from the olfactory memory of those long-ago cookies. As children we spent lots of hours visiting at my Nanny and Grampy’s house, and those visits were always topped off with a big soft cookie or two or three. My great-grandfather kept racehorses, and drove a horse and sulky around the track in the field beside their house. Whenever I am close to a racetrack these days I just stop and listen, because that unbelievable rhythm of the horse’s hooves never fails to bring me back to that field. It is so precise, so controlled, and the horse and rider are so in sync that it can be a beautiful thing to watch. In those long-ago days he would put one of us on the sulky with him (OH, that would be pooh-poohed and frowned upon these days, but it was the 70s) and drive once slowly around the track. My friend and I would skulk around the barns, smelling the barny smells and looking for the cats. There is a story, often-told, about a time when I caught one of the cats and was holding it in my arms in the yard. I was backing up, not watching where I was going, of course, and backed right up into an old washtub which was filled with freezing cold water. I went in bum-first and got stuck, and the unfortunate black kitty bolted out of my arms like a streak of soot, flying furiously across the snowy yard back to the barn. My friend was laughing so hard she was unable to assist me out of the bucket for some time. All was made better with a warm blanket and some of Nanny’s cookies, eaten by the steamy warmth of the wood stove. Could there be any better reward? For years I have looked for this recipe, and at last I am going to tackle it. I only hope I can do it justice. If you try it, please let me know how it turns out for you. 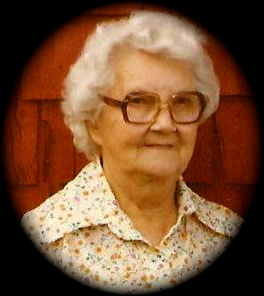 Mrs. Olive Taylor, otherwise known as "Nanny"
small amount of white sugar to dip cookies in. Mix shortening, brown sugar & egg until light & fluffy.Beat in molasses. Add flour & other ingredients. Mix well and refrigerate for 1 hr. Grease cookie sheet and reheat oven to 375. Roll dough into balls, then flatten with a fork. Dip top of cookie in white sugar. Place sugar side up on cookie sheet. Sprinkle each cookie with 2 or 3 drops of water. Bake for 10 – 12 minutes. Cool and enjoy! Makes 3 1/2 dozen. 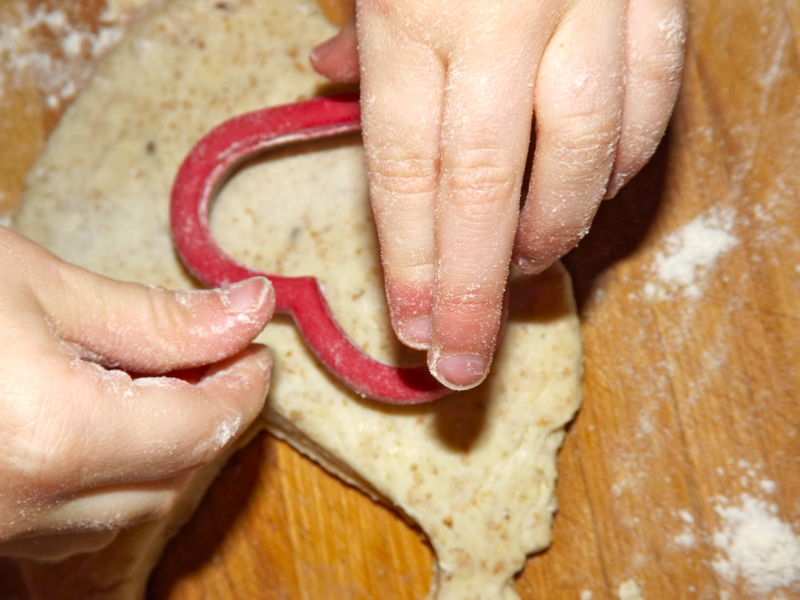 ♥Update: It is now December 13th, and I have made the cookies several times…actually I am eating one right now. Funny how just a smell and a flavour can bring back memories. So good.